February 25, 2019, MSNBC with Ali Velshi, who is generally wonderful. We were supposed to talk about my new book (with Jeffrey Tayler) In Putin’s Footsteps, but what else, spoke about Vladimir Putin, Donald Trump and North Korea instead. If only the news people can find time to have a normal conversation about Russia! February 20, Background Briefing with Ian Masters, mostly about the Putin’s Footsteps book. January 13, 2019, MSNBC on more of Putin and Trump. July 26, 2018, News Rundown on Fox News Radio, Secretary of State Michael Pompeo testifies on Capitol Hill about the Helsinki Summit. Apparently, Fox doesn’t bother to list its “experts” by names. July 15, MSNBC’s AM Joy on Donald Trump-Vladimir Putin meeting in Helsinki July 16 and the Department of Justice indictment of the 12 Russian operatives allegedly interfering in the USA 2016 elections; July 13, 2018, MSNBC news on Trump-Putin meeting; CNBC’s Squawk Box about Putin and Trump, too. August 15, 2016, on MSNBC’s Hardball with Chris Matthews about Vladimir Putin, Ukraine’s ousted Victor Yanukovich and Donald Trump’s now fired shady-political-operative Paul Manafort; August 14, on MSNBC re: DNC hacks and possible sanctions against Russia; August 5, on MSNBC in regard to Trump being a victim of the spying Putin: Dear Americans, fact check–Putin DID NOT create Trump, you did; Putin just takes advantage of it, sort of; don’t you do the same all around the world!? July 30, MSNBC’s AM Joy on Putin, Trump, Russia and America; July 27, Dozhd TV and Amerikanskie Gonki s Kontantinom Eggertom about the US 2016 presidential elections (in Russian); April 9, on MSNBC about Russia and the Panama Papers scandal; Jan 21, on CNBC on the falling Russian ruble; Jan 17, 2016, Iran, diplomacy and foreign policy, on one of the last Melissa Harris-Perry shows. Will so miss these very sophisticated discussion at MSNBC. October 17, 2015, Barack Obama’s foreign policy legacy debate on MSNBC’s Melissa Harris-Perry. In September 2015 Vladimir Putin has returned to the news (and the UN in ten years) with the 70th session of its General Assembly. Did he stare president Obama down with Russian troops edging into Syria–to fight ISIS, to protect Bashar al-Assad, to make sure Russia is there when Assad falls, to mark the territory where Putin has a naval base, the port of Tartus? MSNBC on Up With Steve Kornacki (Oct 3); The Rachel Maddow Show (Sep 28); The Rundown with Jose Diaz-Balart (Oct 6), also on The Rundown (Sep 29) and another moment with Jose (Sep 15); also on Bloomberg TV (Oct 2), HuffPost Live (Sep 30), and on Al Jazeera America (Oct 2) as well as on Al Jazeera America with Tony Harris (Sep 10). And these are just the ones that have links. 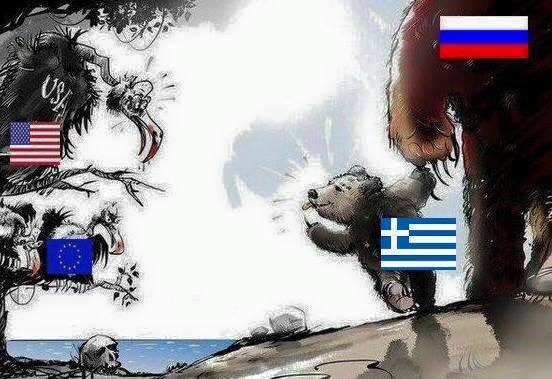 Putin just doesn’t give US and Western Europe a break, trying to sway more countries to his side, Greece being the latests: July 6 and June 19, 2015 on CNBC with with the very smart Kelly Evans. Per our conversation, a telling cartoon from a Russian newspaper. June 11, on Putin’s visit to the Vatican and his charm offensive on Pope Francis, Al Jazeera America. Well, Putin was late for the meeting, as usual, but the gracious Pope absolved the charming Russian anti-Bond. June 9, Huff Post Live on G7 summit and what Putin is up to concerning the West and the un-West. May 10, 2015 on Putin’s Victory Day parade and Russia’s past and future, Background Briefing with Ian Masters, KPFK Radio; May 8 on Al Jazeera America on the anniversary of World War II and the parade; April 17 on Al Jazeera America on Putin, Ukraine and the US; April 8 on Al Jazeera America: Putin met with Alexis Tsipras of Greece. Is Putin seeking to split off Europe? Of course, he does. April 2, On the Media about the House of Cards Putin (aka president Petrov) Moscow episode; March 16 commenting on Putin’s temporary vanishing on CBS This Morning and MSNBC’s The Rundown with Jose Diaz-Balart; March 4, also about Putin on RoadMap, a new MSNBC Shift show. 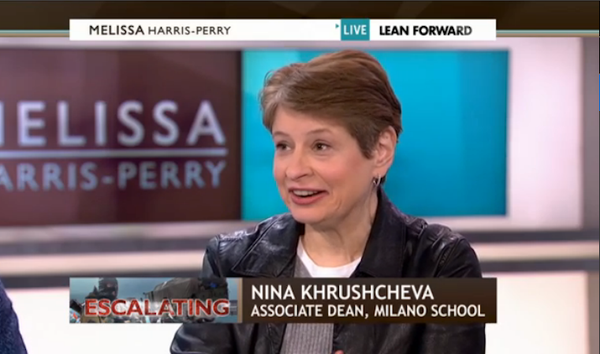 Feb 28, speaking about Boris Nemtsov’s horrible murder on Al Jazeera America and on Feb 25 continue the Ukraine and Russia conversation, again on Al Jazeera America; Feb 15, on MSNBC’s Up with Steve Kornacki about Ukraine peace plan and Putin’s intentions; Feb 8, on MSNBC’s Melissa Harris-Perry show: ISIS Hostage Holding; Barack Obama and Crusaders Comment; and Arming Ukraine; Feb, 5 on Al Jazeera America Evening News talking about attempts at new peace deal with Putin; Jan 26, on The Rundown with José Díaz-Balart. Dec 21, 2014 on Al Jazeera America Sunday News; Dec 19, on MSNBC’s Jose Diaz-Balart show; Dec 18, on Joy Reid Report about The Interview and North Korea; Dec 17, talking about Vladimir Putin, Economy and Geopolitics for HuffPost Live and about The Year of Putin for SunNews Network’s Straight Talk (Canada); Dec 16, CNBC’s The Closing Bell discussing falling ruble and oil prices and on Al Jazeera America with my absolutely favorite Tony Harris. Dec 5, Russia’s State of Empire on Power Vertical podcast, Radio Free Europe Radio Liberty; Dec 4, BBC Newshour (36 min) on Vladimir Putin’s State of the Union Address. Sanctions are working (for the time being), G-20 is happening Nov 14 in Brisbane, and Putin is grandstanding to conceal his weak hand–weak states have weak liberties–so I was on MSNBC with awesome Joy Reid of the Reid Report, Nov 13, and on the same day on Last Word with Lawrence O’Donnell. Talking with the knowledgeable Ian Masters about the 25th anniversary of the fall of the Berlin Wall, and about how Russia under Vladimir Putin has fallen back into the Cold War mode of anti-Western animosity on Background Briefing, Radio Pacifica, Nov 9. Interview with RFERL Power Vertical podcast “The World According to Putin,” Nov 7, on what used to be the main Bolshevik holiday. Holiday no more, yet Russia has changed little. Also The Fall of Nikita Khrushchev on BBC, Oct 14, 2014. On Women’s Media Center Live with Robin Morgan, Sep 20, and, of course, on MSNBC: with Jose Diaz-Balart, Sep 18, Daily Rundown, Sep 8, Melissa Harris-Perry Show, Sep 6, The Reid Report, Sep 3, also on CNBC’s Closing Bell, Sep 2. I love MSNBC, but it’s very refreshing to talk to the “money people,” they are very much to the point. Putin isn’t letting Ukraine off, not that we expect he would unless he decides he should. A few from June, July, August 2014: NBC’s Squawk Box Aug 14, July 21; MSNBC’s Andrea Mitchell Reports Aug 29, July 23; Rachel Maddow Show July 22, July 18; Ronan Farrow Daily July 21, July 17; All In With Chris Hayes July 21; Melissa Harris-Perry Show Aug 30, July 19; Up with Steve Kornacki July 20; Politics Nation July 17 and Al Jazeera America Aug 10, July 19, July 17, June 7. So very appreciative of those who have talked to me about my new book, The Lost Khrushchev: A Journey Into the Gulag of the Russian Mind: the erudite Ian Masters of Background Briefing from Radio Pacifica, June 29, 2014; the wonderful Mark Barton of Bloomberg on Ukraine and on why Russia is always Russia–the Gulag of our minds, June 23, 2014; the brilliant Brian Whitmore of Radio Free Europe Radio Liberty’s Power Vertical podcast, June 13, 2014. Always grateful to the remarkable Kathleen Parker for her appreciation of my clues on Vladimir Putin and for her Washington Post April 18th suggestion that I should get the White House cubicle. FYI, the White House hasn’t yet called. More interviews from April and May: with Al Jazeera America, with Democracy Now, with Canada’s SunNews Network, with MSNBC’s live feed news and news with Craig Melvin, also alone with Melissa Harris-Perry (such an honor! we were supposed to discuss The Lost Khrushchev, but Russia got in the way–doesn’t it always?) and another time on Melissa Harris-Perry as part of a distinguished panel. 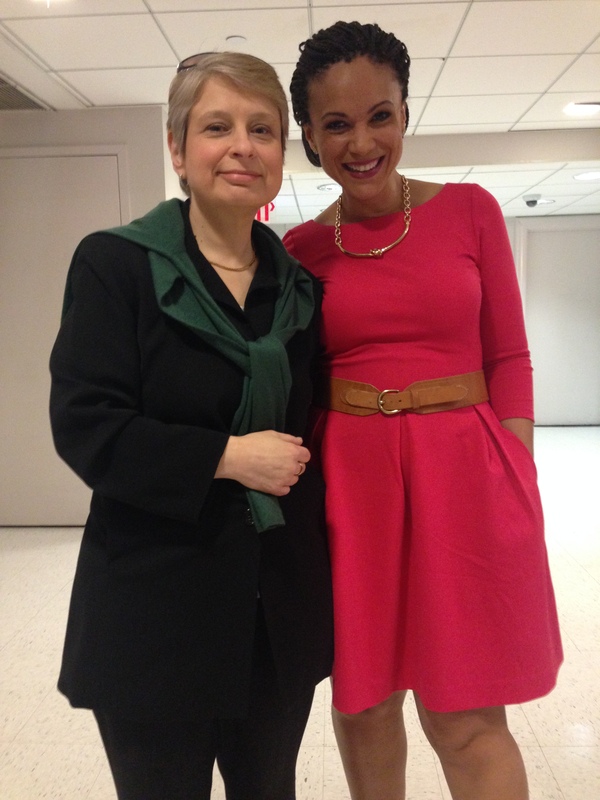 Pic is taken after the interview with MHP, who always rocks, so stunningly pretty, and smart. 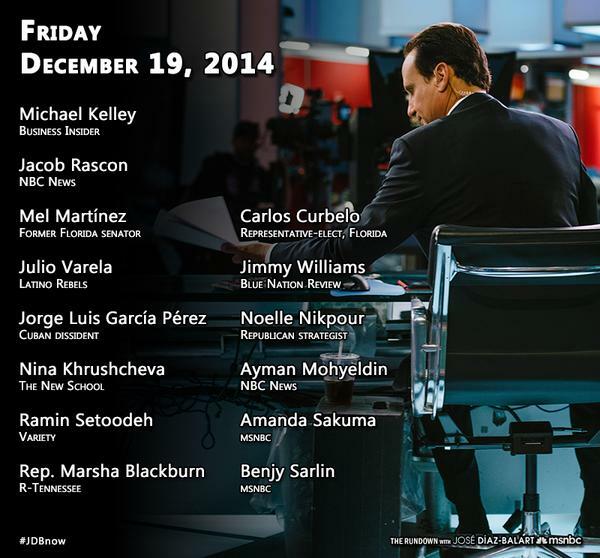 More MSNBC commentaries for Jansing and Co, The Daily Rundown, The Reid Report, Ronan Farrow and another Ronan Farrow. Interviews with Austria’s daily Der Standard, with Macleans magazine in Canada, with London’s TLG magazine, with Estonia’s Postemees, with Consider This on Al Jazeera America, with Voice of America (in Russian), and with Women’s Media Center Live. Finally, on March 29, 2014 my 2008 argument from Imagining Nabokov about Russian literature as politics has come into play. A wonderful NPR piece by Linton Weeks on Putin coming right out of Russian novel. Since Crimean transfer to Ukraine in 1954 has been squarely blamed on my (great) grandfather Nikita Khrushchev, with the great Putin oh so unflinchingly usurping it back to Russia almost 60 years to the day I have been going through my own March Madness. Interviews among others are The Times (of London) (3/22/14) and a great honor from the Pulitzer Prize winning journalist Kathleen Parker in Washington Post (3/18). She is brilliant and actually made me sound smart. Also a small thing in the Italian magazine L’Espresso (3/27). On TV: Fox Business (3/10), for a liberal like me, yay! ; NOS (The Netherlands) (3/11); CNN International (3/14) and CNN’s International Desk (3/16); my favorite MSNBC with Melissa Harris-Perry show (3/15), with Ronan Farrow Daily (3/19), with Andrea Mitchell Reports (3/21); Al Jazeera America (3/17; 3/19) and BBC (3/21; 3/20). On radio shows: Ian Masters (3/9); John Batchelor (3/9); Julie Mason, thankfully this was more in relations to my Reuters article about Russia’s delusions (3/12); WNYC’s The Takeaway (3/16); RFERL’s Power Vertical podcast (3/21) and British Monocle 24 (3/21; 7.50 min into the program). BTW, Monocle is absolutely great for all international (and other) matters. I don’t post everything here (would be too redundant), but for good measure my Russia Today (March 9, 2014) battle against state propaganda. Must admit, RT is Orwellian of decent quality: Love is Hate, Truth–Lie, Weakness–Strength. The anchor who told me she was trained in the US–she learned her prop skills there, she meant–somehow had no idea that there is a difference between slanting truth (PR) and distorting truth (Propaganda). Young and vigorous, she sounded like Mikhail Suslov, chief Soviet propagandist of the old, who warned of class struggle and bad Western influences. For my show host, the fact that Vladimir Putin is popular is a mandate enough for him to do whatever. By that logic, since Ukraine’s Victor Yanukovich was unpopular he had to be overthrown. Yet this logic only works for the new “Soviet” propagandists when it suits them. I couldn’t even make my point–she had the final word. BTW, in American journalism schools students are taught that a guest speaks last, and the anchor doesn’t take last minutes to vent her views. Unless you are Fox New. What am I saying, RT is Fox News, equally “fair and balanced.” Well, RT wasn’t even professional enough to book their guest (me) a car, I had to take cabs there and back for the pleasure of being barraged by the Kremlin mouthpiece. Still, was well worth it for my own propaganda studies. Good to know that either Soviet or Russian, the Kremlin hasn’t lost its touch; regrettably, it further proves my Gulag of the Russian Mind theory. Die Presse on Putin and Ukraine, March 5, 2014. I admire the Austrians for always being so interested in what’s happening in their backyard. Interview with Radio 24 of Il Sole 24 Ore on Putin Pericoloso, March 4, 2014. Italian is such a beautiful language, even Putin sounds less dangerous.